This page describes the role of photosynthesis and algae, also known as cyanobacteria, in creating free oxygen in the Earth's atmosphere. Figure 1: Oxygen bubbles created by a type of blue-green algae, also known as cyanobacteria, on a sunny day, by the process of photosynthesis. Photo by Andy Fyon, Lime Kiln trail, Ottawa area, May 3/17. Oxygen, like water, is life. Without oxygen, most life on Earth would not exist. In this note, I discuss the origin of oxygen in the Earth's atmosphere, using a modern-day analogy where pond algae creates oxygen on a sunny day, using the process called photosynthesis. In his book entitled "The Story of Earth", author Robert M. Hazen explains how the major Earth systems - rocks, oceans, atmosphere, and life - work together to support life on Earth. Oxygen in the Earth's atmosphere is part of the atmosphere system. Early in the history of the Earth, primitive algae created oxygen, using photosynthesis, and changed the Earth's atmosphere from one that was poisonous to one that is life-giving. Modern algae follow the same process to create free oxygen (Figure 1). Figure 1: A type of algae, in a small pool of water, uses photosynthesis to create oxygen gas. Photosynthesis is a process by which plants use Sunlight to convert carbon dioxide and water into sugars and by-product oxygen. The sugars are used as food for the algae. The oxygen bubbles first attach to the algae before being liberated into the Earth's atmosphere. The small water pool occurred on limestone. That limestone is part of a larger system and habitat called open alvar pavement. Location: Michael's Bay, Manitoulin Island, Ontario, July 29, 2006. Photo by Andy Fyon. The Earth is surrounded by an envelope called our atmosphere. The Earth's atmosphere contains about 21% free oxygen and about 78% nitrogen gas. Today, humans, and most other life forms on Earth, need life-sustaining oxygen from the Earth's atmosphere. But, the Earth's atmosphere did not always contain free oxygen. In the beginning, shortly after the Earth formed, the Earth's atmosphere was a mix of deadly gases that would have been poisonous to humans and many other life forms had they existed at that time. The Earth's early atmosphere did not contain free oxygen. The addition of free oxygen to the Earth's atmosphere was linked to other Earth systems - oceans and life. In fact, the evolution of life on Earth played a very important role in the creation of an oxygen-rich atmosphere. So, what happened to change the initial, poisonous, Earth's atmosphere to one that now contains free oxygen? To answer that question, we need to understand a little bit about the origin and development of the Earth, its oceans, life on Earth, and its atmosphere. The origin of the Earth was part of the formation of our solar system, which we will cover only superficially here (Figure 2). About 4.6 billion years ago, our Sun was created from gas and dust within a large nebula called the Milky Way. The creation of our Sun, and the rest of our solar system, swept up most of the gas and dust within the Milky Way nebula. But some material was left over (Figure 3). This left-over material consisted of gases, small dust grains, mineral fragments, rocks, and small solid bodies. The left-over material began to clump together by gravitation attraction between materials. 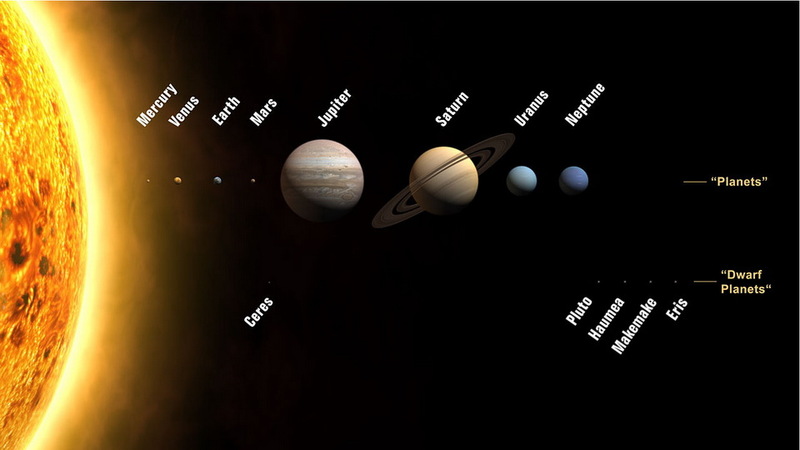 Those clumps got bigger and bigger and eventually the bigger clumps were able to form the Earth and the other planets in our Solar system. An enormous amount of heat energy was released when the left-over material smashed into each other to create the larger bodies. Heat released by the collisions (and from the decay of radioactive elements) caused the larger bodies to become very hot. In fact, the growing Earth became so hot that it partially, or completely, melted (Figure 4). The aggregation and formation of planet Earth was largely completed about 4.567 billion years ago. At this stage, the early Earth did not have an atmosphere. As the young Earth cooled, its surface, or crust, turned into a solid. Partially melted material, called magma, moved from deep within the new Earth to the surface to form Volcanoes. The volcanoes erupted through the Earth's new, thin crust (Figure 5). The exploding volcanoes released a complex brew of gases that was dissolved in the magmas. These gases became the Earth's early, poisonous atmosphere (Figure 6). Some scientists suggest that the Earth's early atmosphere contained a poisonous mix of gases like hydrogen sulfide, methane, and a lot of carbon dioxide, and much smaller amounts of water vapour and ammonia. Others argue that the Earth's early poisonous atmosphere was composed of water vapour, carbon dioxide, and sulfur dioxide. Regardless of the exact gases, there is general agreement that Earth's early atmosphere did not contain free oxygen. Now, how did the Earth's early poisonous atmosphere change to one that contained free oxygen needed to support life as we know it? That change is linked to the formation of oceans on the Earth's surface. But why oceans? Well, life on early Earth began in the oceans - water is life. It was the early life in the oceans that created the free oxygen required to profoundly change the Earth's atmosphere. So, when exactly did early oceans form on the surface of the Earth? Evidence for the formation of the early oceans comes from ancient rocks - the record keepers of Earth history. It appears that by about 4.3 billion years ago, the surface of the Earth had cooled and solidified enough to allow water vapour in the atmosphere to rain out and collect in one or more oceans (Figure 6). Evidence for the existence of an early ocean comes from rocks in the Nuvvuagittuq Belt, northern Quebec. The Nuvvuagittuq Belt contains iron-rich rocks called banded iron formation. The banded iron formation formed on the bottom of an ancient ocean. These banded iron formation rocks occur within other rocks that formed at least 3.75 billion years ago and that may have formed 4.32 billion years ago. There is debate about that age of the early ocean. Was it really 4.32 billion years old? Regardless, the evidence tells us that early oceans had formed on the Earth's surface 815 million years after the Earth had formed and may have formed only 200 million years after the Earth had formed! So, if the oceans were the cradle of life, when did life appear on Earth? filament-like fossils from Australia may be fossil remains of algae that lived 3.5 billion years ago. fossil structures called stromatolites, created by 3.7 billion year old blue-green algae called cyanobacteria, are preserved in Greenland. evidence for 3.8 billion year old life has been described from rocks from Akilia Island, Greenland. graphite, a form of pure carbon, found in 3.95-billion-year-old rocks from northern Labrador, shows a geochemical signature of having come from the decomposition of living organisms. tube-like shapes in rocks from the Nuvvuagittuq Belt, Quebec, Canada, are interpreted to be fossil remains of simple bacteria that lived on the bottom of an ocean at least 3.75 billion years ago and perhaps 4.32 billion years ago. Together, this evidence tells us that life existed on Earth, in the early oceans, at least 3.5 billion years ago, and perhaps 4.3 billion years ago. What role did these primitive life forms play in changing the Earth's early poisonous atmosphere to one that contained the free oxygen needed to support life as we know it? The answer to that question is "photosynthesis". Figure 7: This cartoon illustrates the process of photosynthesis in plants. The plants "eats" Sunlight, carbon dioxide and water and produces sugars and carbohydrates produced are stored in, or used by, the plant and free oxygen as a waste product. Image from Wikipedia. This present-day photosynthesis takes place on land, in shallow water, and inside and below clear ice - wherever there is sufficient Sunlight. When primitive life first appeared on Earth, at least 3.5 billion years ago, there were no plants, but there were primitive bacteria and algae living in early oceans. Those primitive bacteria and algae produced the free oxygen, through photosynthesis, which changed the Earth's atmosphere. The oxygen producing bacteria are called blue-green algae or cyanobacteria. When Did Oxygen-producing Life Appear On Earth? We don't know exactly when the oxygen-producing bacteria appeared on Earth. In fact, it is likely that the very first primitive bacteria did not use photosynthesis. Rather, the very first primitive bacteria used a completely different process, called chemosynthesis, to generate its food energy. It is not necessary to fully understand the distinction between photosynthesis and chemosynthesis. It is sufficient to know that both processes were, and are, used by different types of organisms to produce food. Photosynthesis is powered by sunlight, while chemosynthesis runs on chemical energy. Fortunately for much life on Earth, the reign of primitive organisms that used chemosynthesis to produce food was joined by bacteria that did produce free oxygen by photosynthesis. So, once the primitive blue-green algae, or cyanobacteria, started to produce free oxygen, at least 3.5 billion years ago, how long did it take to change the Earth's atmosphere? 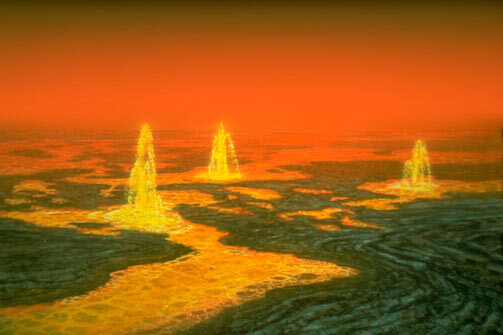 Likely most initial free oxygen produced by the primitive bacteria was destroyed immediately by other chemicals in the ocean and atmosphere; therefore, free oxygen did not immediately accumulate in the atmosphere. However, the rocks tell us that something important happened to the Earth's atmosphere about 2.5 billion years ago, when free oxygen began to concentrate in the Earth's atmosphere (Figure 8). The was called the Great Oxygenation Event. During The Great Oxygenation Event, free oxygen concentrations in the Earth's atmosphere increased near or above modern levels. So, between 2.5 and 2.3 billion years ago, there was enough free oxygen in the Earth's atmosphere to profoundly it from a poisonous atmosphere into one that supports modern life on Earth! Figure 8: Primitive blue-green algae, also known as cyanobacteria, are thought to have created free oxygen using the process of photosynthesis. The cyanobacteria, preserved in fossil structures called stromatolites, had appeared on Earth as long ago as 3.5 billion years ago - perhaps even earlier. The initial free oxygen was soaked up by the ocean, but at about 2.5 billion years ago, the free oxygen began to accumulate in the Earth's atmosphere - the journey of life on Earth was profoundly changed at that time. Image source: Archaean Stromatolites: signal of the Great Oxidation Event. 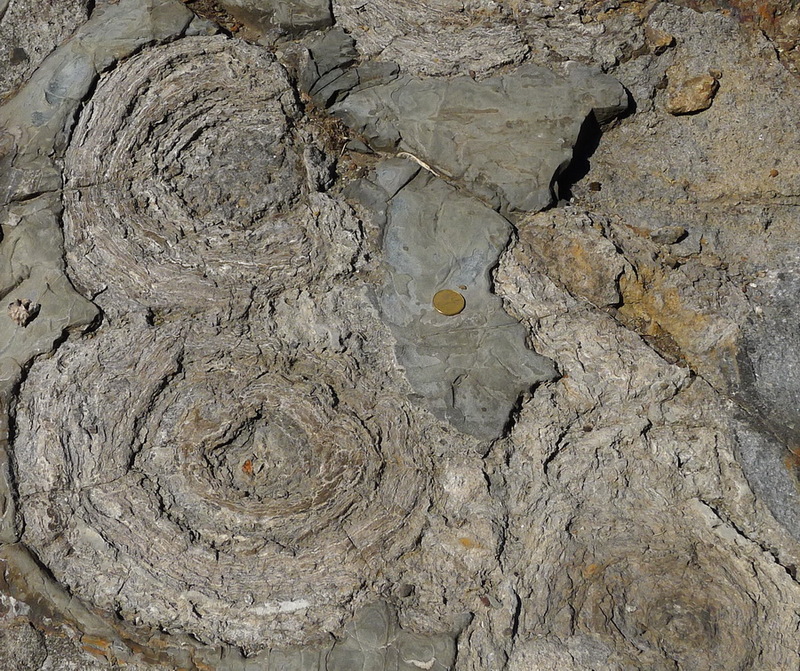 Fossils, called stromatolite (Figure 9 and 10), are preserved in the ancient rocks. These fossils were built by primitive bacteria that created the free oxygen by photosynthesis. The presence of these stromatolite fossils tell us that oxygen-producing cyanobacteria existed on the Earth at least 3.7 billion years ago. Figure 9: Stromatolites exposed in the Thunder Bay, Ontario, Canada area. Stromatolites are shaped a bit like a mushroom. The top of these stromatolites was eroded off during the last great ice age. Photo by Andy Fyon, May 15, 2013. Figure 10: Cross section of a several stromatolites. The stromatolites grew up, towards the Sun, which is towards the top of the photo. 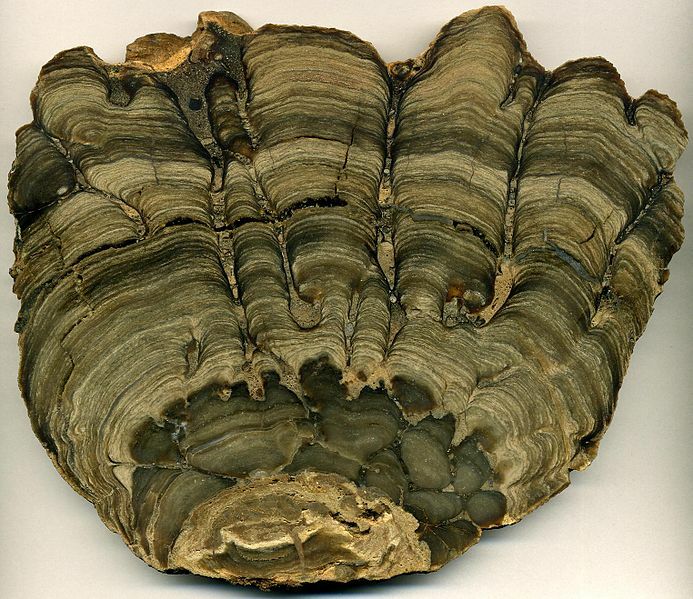 This stromatolite fossil example comes from the Fort Laclede Bed, Laney Member, Green River Formation of south-western Wyoming, USA. It is the preserved fossilised remains of a stromatolite that lived in the ancient Lake Gosuite. This is a cross-sectional slice through the fossil, showing its internal layered structure. Photo from Wikipedia. In this note, we covered a lot of geological time and Earth history. That journey began with the creation of the Earth 4.56 billion years ago, the formation of Earth's first poisonous atmosphere, the formation of the Earth's first oceans, followed by the appearance of primitive life in the oceans by at least 3.7 billion years ago. The primitive life forms were called blue-green algae, or cyanobacteria and they used photosynthesis to create free oxygen. That free oxygen began to change the Earth's atmosphere such that by about 2.5 billion years ago, the concentration of oxygen in the atmosphere was similar to the modern concentration. Today, when we observe tiny oxygen bubbles attached to blue-green pond algae, we are witness to one of the most important steps in the early history of the Earth. We are seeing the creation of free oxygen by modern cyanobacteria, using photosynthesis - similar to the process used by their great ancestors at least 3.7 billion years ago. That is the story of oxygen in our atmosphere, as seen hidden in the ancient rocks - the Ontario Beneath Our Feet! Research into the early history of photosynthesis continues. Questions are still being asked like "when did photosynthesis start on Earth? ", "how did photosynthesis evolve to present day? ", and "were ancient and modern photosynthesis processes the same?". For a more detailed discussion of the state of this research, check out this article.